Band of Horses had everything but a sweet spot. Critics said that Everything All The Time and Cease To Begin were far too emotional to be effective "alternative folk" albums and they said that Infinite Arms lacked enough emotion to be a great "alternative folk" album. Even though Band of Horses had created three of the 21st centuries best songs, have created two great albums, and have become one of the more popular acts in their genre, critics made it sound like they couldn't do anything right. No matter what BOH did the critical hypocrisy sounding their releases would always stop them from being recognized for what they really are: one of the more consistent indie folks acts of our generation. With the release of Mirage Rock, Band of Horses have found a flawless sweet spot: the album easily combines the emotional, atmospheric, and catchy nature of Everything All The Time and Cease To Begin with the structured and more produced sounds on Infinite Arms. The album has great rock songs, a few outstanding "emotional" songs, and even a few strictly country songs. Mirage Rock combines all the outstanding qualities from Band of Horses first three album together on just about every track without losing the flow of a conventional album. So even though the album has the quality of a greatest hits album, combining all of the best qualities of Band of Horses first three albums, yet it still has the flow, structure, and lyrical themes of an actual album. This means that Band of Horses not only have found their sweet spot; they have found the sweetest of all spots musically. 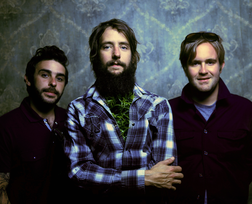 Posted by Blair James Chopin Labels: Artist Of The Day, band of horses, Blair Chopin.